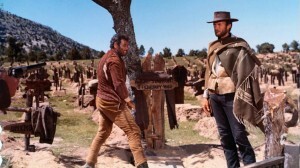 During my recent viewing of the 1965 movie, “SHENANDOAH”, I came to the surprising conclusion that it proved to be entirely different than what I had assumed it would be. But it is not surprising that it would take several years for the movie to be appreciated by today’s audiences than it was back in 1965. Like I said, “SHENANDOAH” is an unusual film. Set in 1864, during the U.S. Civil War, the movie is about the efforts of a sardonic Virginia farmer and widower named Charlie Anderson to prevent his sons from fighting in the war. Although, he is sympathetic toward the travails his neighbors face from the Union Army’s presence in the Shenandoah Valley, he feels no obligation to fight on behalf of a state he believes had never help him maintain his farm. Nor does he support the Confederacy’s pro-slavery stance. His neighbors seem willing to tolerate his pacifist stance, although a few like Pastor Bjoerling occasionally make barbed comments. Not long after his only daughter’s wedding to neighbor and Confederate Army officer Sam and the birth of his first grandchild, Charlie’s family fortunes take a turn for the worse. His youngest son, 16 year-old Boy, is captured by Union soldiers, while playing with his close friend Gabriel, a neighbor’s slave. Boy had been wearing a Confederate Army kepi cap he had earlier found. When Gabriel informs the Anderson family of the news; Charlie, most of his sons and daughter Jennie leave to look for Boy. 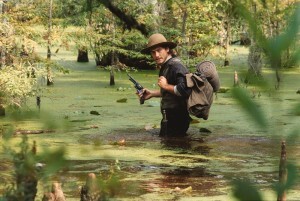 They leave James and his wife Ann at the farm with their young baby. 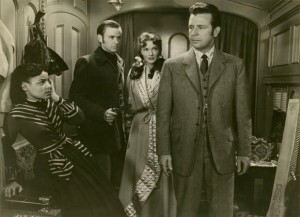 While watching the first twenty to thirty minutes of “SHENANDOAH”, one gets the impression of watching a warm family comedy-drama with a Civil War setting. I almost felt as if I were watching “THE WALTONS” in a 19th century setting. There are very few characters in uniform. 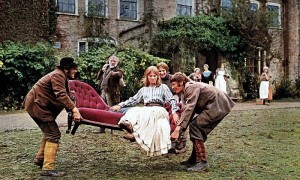 The movie featured the Anderson family at home, at work and a mildly amusing scene of them arriving late at church during the beginning of the sermon. And when the war did infringe upon their lives, the family usually responded in humorous ways – namely their boisterous fight with a state official and soldiers trying to acquire horses for the army, and a stand-off between Anderson’s sons and a group of army recruiters. By the time Charlie and his family set out to find the missing Boy, I felt certain that their adventures would be exciting, topped by a happy ending. Charlie and the rest of the Andersons got their happy ending. . . but at great costs, thanks to the Union Army, the Confederate Army and a group of deserters. The movie’s growing dark tones and anti-war sentiments really took me by surprise, considering its earlier tone. But what really took me by surprise is that the movie’s changing tone had been gradual, thanks to director Andrew V. McLaglen and screenwriter James Lee Barrett. There were scenes in “SHENANDOAH” that really impressed me. 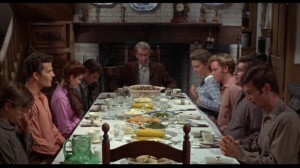 I enjoyed those scenes with Charlie’s conversations with his future son-in-law, Sam, and his daughter-in-law Ann; due to their heartwarming nature, Charlie’s outlooks on both his family dynamics and dealing with marriage, and fine performances from James Stewart, Doug McClure and Katherine Ross. 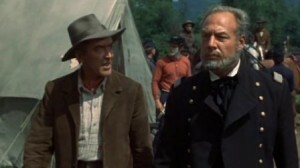 However, his conversation with Union Army officer Colonel Fairchild really impressed me, thanks to Stewart and George Kennedy’s performances, and the way the two men managed to emotionally connect on the horrors of war and fear of losing their sons. Boy’s escape with a group of Confederate soldiers from a riverboat struck me as rather exciting. 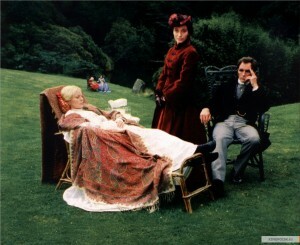 In one of the movie’s earlier scene, Jennie Anderson had encouraged Gabriel to run away from his master. Not only did Gabriel run, he eventually joined the Union Army. This is probably why I found Gabriel’s reunion on the battlefield with a wounded Boy emotionally satisfying. The friendship and warmth the two boys felt for each other had not wavered, despite finding themselves within the ranks of the opposite armies. And I was amazed at how both Philip Alford and Eugene Jackson Jr. managed to convey the close friendship of the two characters with hardly any words. However, I feel that the movie’s two best scenes were featured in the Andersons’ local church. The first church scene proved to be a very funny affair, thanks to actor Denver Pyle’s skillful conveyance of Pastor Bjoerling’s irritated reaction to the Andersons’ late arrival in the middle of his sermon. The second church scene, which ended the film, was a beautifully acted and emotional that surprisingly left me in tears. It had the perfect mixture of relief, happiness and a little pathos that followed the emotionally draining aspects of the movie’s second half. Even after nearly five decades, many people still talk about it. Despite my satisfaction with “SHENANDOAH”, there were some aspects of it that I found troubling. Most of my dissatisfaction came from the movie’s historical portrait of its setting. One of the Union soldiers that captured Boy proved to be black. The Union Army was not integrated in 1864. In fact, I do not believe it was ever integrated during the four years of the Civil War. And for the likes of me, I could not see how all of Charlie’s six sons could have avoided military service during the war’s first three years. His sons, especially Jacob, seemed to have minds of their own. I figured if they really wanted to fight in the war – whether for the Confederacy or the Union – they would have left the farm and join the military. I could not understand how someone as strong-willed as Jacob (who was the oldest) could have allowed his father to prevent him from joining the Confederate Army. And even if all the boys had wanted to remain on the farm, they would have been subjected to the military draft. The Confederacy had enacted the military draft about a year before the Union. And the Andersons were not rich or owned any slaves. I have one last complaint – a minor one at that. Some of the acting by the supporting characters in minor roles sucked. Period. I found their performances rather wooden and could not understand how they managed to get roles in an “A” production like“SHENANDOAH”. 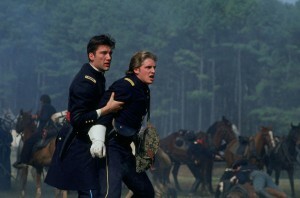 Flaws or not, I can honestly say that “SHENANDOAH” is one of the better Civil War movies I have ever seen. Instead of telling the story of the war from one side or the other, it told the story about a family that desperately tried to avoid being dragged into the chaos and tragedy of war . . . and failed. Thanks to a well-written script written by James Lee Bennett and a talented cast led by the even more talented James Stewart, director Andrew V. McLaglen crafted an excellent story about the Civil War that proved to be more emotional and surprising than I could ever imagine.